The roles of this ancient breed are as varied as their reputed ancestors. They were used as dogs of war, guarding the borders of Dalmatia. To this day, the breed retains a high guarding instinct; although friendly and loyal to those the dog knows and trusts, it is often aloof with strangers and unknown dogs. 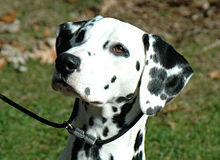 Dalmatians have a strong hunting instinct and are an excellent exterminator of rats and vermin. In sporting, they have been used as bird dogs, trail hounds, retrievers, or in packs for wild boar or stag hunting. Their dramatic markings and intelligence have made them successful circus dogs throughout the years. ^ "''Fédération Cynologique Internationale Standard of Dalmatian'', No. 153, dated 14 April 1999" (PDF). Fci.be. Retrieved 2011-10-26. ^ "Dalmatian – FCI Standard" (PDF). Retrieved 2013-08-12. 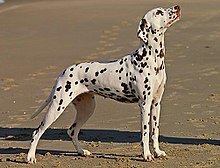 ^ Forever, Dalmatians. 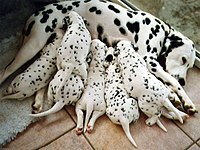 "Dalmatians and 9 Things You Should Know About Them". 5amily. Retrieved 2019-03-08. 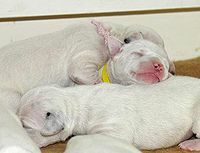 ^ "When Do Dalmatian Puppies Get Their Spots? | Cuteness". Cuteness.com. Retrieved 2018-09-11. ^ Proctor PH (1988). "Free Radicals and Human Disease". In Weber HH, Miquel J, Quintanilha AT. Handbook of free radicals and antioxidants in biomedicine. 1. Boca Raton: CRC Press. pp. 209–21. ISBN 978-0-8493-3268-5. 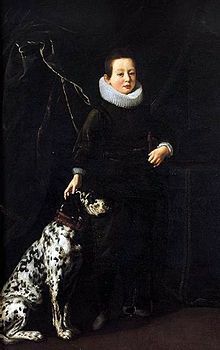 ^ "The history of Dalmatians in the fire service". 2017-02-10. Retrieved 2018-09-11.